Style Section LA . . . Frame That One! Hey, statement shoes . . . walk on by! Style Section LA declares 2010 the year for statement spectacles with a feature story written by frame fashion fanatic Jeremy Allen. Highlighted with l.a.Eyeworks are the O'mazing O'Connell sisters, Amy and Katie, at Society of the Spectacle, and the master craftsman Sung Kim at Eyetailor. This provocative article is already raising eyebrows among the bespectacled: Was Jeremy truly capable of fibbing his way into frames? Does anyone else sense a Gai Gherardi-Steve Jobs throw down coming? Why are the socialite pug princesses Penny and Violet absent from the Society of the Spectacle portrait? Dig through the clues here. Legendary K-9 l.a.Eyeworker, Penny O'Connell, celebrates her first 15 years on Earth! 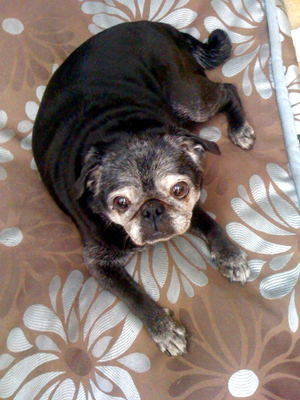 Penny, the hardest working pug in the optical biz, knows how to handle the dog days of summer. You can check out Penny's sidekick Ricky in the new Pug Love photo album. The more photos the better, so let the Pug tidal wave begin!